Author Joseph Bruchac was warmly welcomed to Lanigan Elementary during a recent visit. 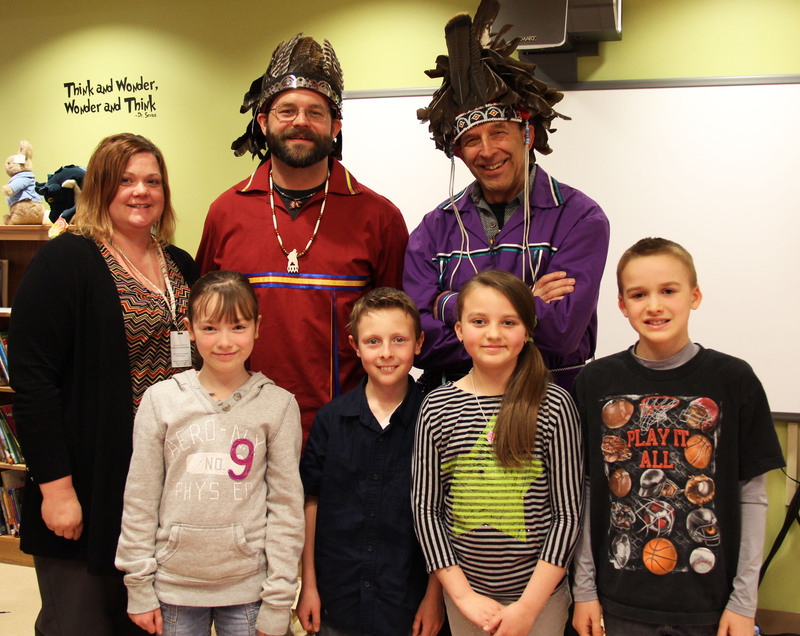 Author Joseph Bruchac and his son, Jesse, visited Lanigan Elementary School on May 7. Pictured in back from left are Library Media Specialist Jessica Somers, Jesse Bruchac and Joseph Bruchac. In front are students Emma Green, Tanner Tetro, Olivia Saunderson and Tyler LaDue. Students in fourth grade read several of Bruchac’s chapter books in anticipation of his appearance, and also created posters on those same books to decorate the library’s hallway. Bruchac creates poetry, short stories, novels and music that reflect his Abenaki Indian heritage and Native American traditions. Many of his writings focus on legends, and finish with a valuable lesson. His son Jesse, a musician, accompanied him on the visit. Bruchac has written over 130 books in his career. The main characters in these stories are often of Native American decent, and are set in the present day. “In order to be a good storyteller, you must be both the traveler and the guide,” said Bruchac. Bringing the listener along the path is more important than memorizing exact words of a story. As stories are told over generations, they evolve. 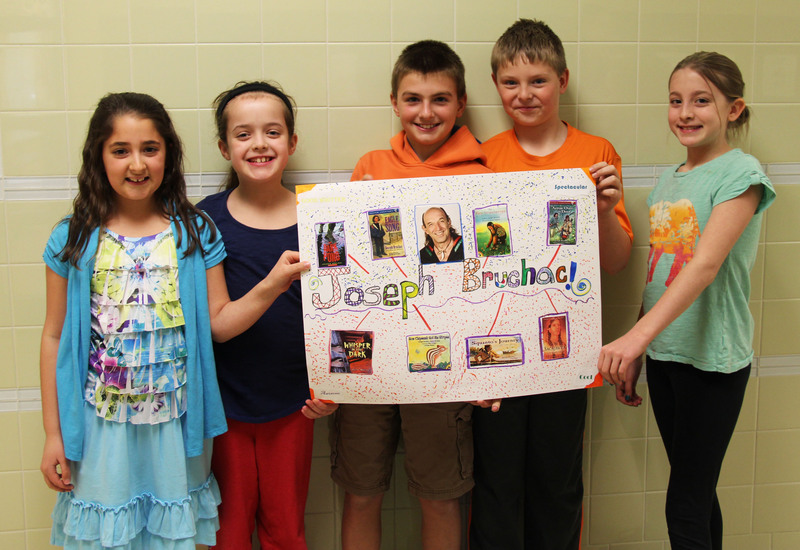 Students in fourth grade at Lanigan Elementary created posters welcoming author Joseph Bruchac to their school. From left are: Claire Brodrick, Mary Jane Mullaney, Mikey Brown, Dalton Hines and Christina Tallents of Tracy Waldron’s class. Jesse Bruchac told the story of a great warrior who took a flute and devised a song to win a women’s heart. As he grew unsatisfied with his female company, he would play a different song to attract a different wife. In the end, his greediness transformed him from a man to the world’s first weasel. Bruchac shared the story of Skeleton Man to students in fourth grade, who were familiar with the book of the same name. The tale is based on a Mohawk legend about a cannibal monster that eats himself down to the bone before turning his appetite to his family. Bruchac created an atmosphere of suspense that had students on the edge of their seat. The Bruchacs finished their presentation with a song and advice on writing stories of their own.